January 2012: The UK Department for Business, Innovation and Skills granted export licences to an unnamed UK chemical company on 17 and 18 January 2012 to send dual-use chemicals [that are used in production of sarin] to Syria — for “use in industrial processes”. The Business Department said “it had accepted assurances from the exporting company that the chemicals would be used in the manufacture of metal window frames and shower enclosures”. A Department spokesperson said these chemicals were requested “for metal finishing of aluminium profiles used in making aluminium showers and aluminium window frames”. July 2012: The permits were eventually revoked in July, in response to tightened European Union sanctions — before these chemicals were exported. Critics said “it appeared the substances had only stayed out of Syria by chance”…. “Although the export deal, first reported by The Sunday Mail in Scotland, was outlawed by the EU on 17 June last year in a package of sanctions against the regime of Bashar al-Assad, the licences were not revoked until 30 July. Chemical weapons experts said that although the two substances have a variety of uses such as the fluoridation of drinking water, sodium and potassium fluoride are also key to producing the chemical effect which makes a nerve agent such as sarin so toxic”. Source: “Revealed: UK Government let British company export nerve gas chemicals to Syria: UK accused of ‘breath-taking laxity’ over export licence for potassium fluoride and sodium fluoride”, by Cahal Milmo, Andy McSmith , Nikhil Kumar, published by The Independent on 2 September 2013, posted here. But, The Daily Mail reported on 7 September that: “Between July 2004 and May 2010 the Government issued five export licences to two companies, allowing them to sell Syria sodium fluoride, which is used to make sarin. The Government last night admitted for the first time that the chemical was delivered to Syria – a clear breach of international protocol on the trade of dangerous substances that has been condemned as ‘grossly irresponsible’… The sales were made at a time when President Bashar Assad was strongly suspected to be stockpiling the chemical weapons that have caused an international crisis. The UK firms delivered sodium fluoride to a Syrian cosmetics company for what they claim were legitimate purposes”. Source: “Britain sent poison gas chemicals to Assad: Proof that the UK delivered Sarin agent to Syrian regime for SIX years”, Mark Nicol, The Daily Mail, 7 September 2013 – updated 8 September 2013, posted here. It appears that the news of these sales + export licenses was leaked in the immediate aftermath of the parliamentary defeat of the UK Government motion, at the end of August 2013, to join in proposed military strikes on Syria in the aftermath of the 21 August 2013 #CW attacks on Ghoutha which killed hundreds, possibly over 1500, of civilian casualties. 13 July 13 2012: News reports indicated that the Syrian government was moving its #CW stockpile to one or more undisclosed location[s]. 13 July 13 2012: Pentagon Press Secretary George Little told reporters at the Pentagon later that same day, however, that “The Syrian regime has control of its chemical weapons stockpiles”. He added: “We believe that the Syrian government has a very serious responsibility to protect its stockpiles of chemical weapons…We would, of course, caution them strongly against any intention to use those weapons. That would cross a serious red line”. And, he said, if any Syrian officials choose to utilize chemical weapons they will be held accountable for their actions. Little added that “We are watching very closely — not just the United States, but the international community — to make sure that they maintain control over those stockpiles, and of course, to ensure that they don’t use them”… Posted here. 20 August 2012 – US President Barak Obama: “We have been very clear to the Assad regime, but also to other players on the ground, that a red line for us is we start seeing a whole bunch of chemical weapons moving around or being utilized. That would change my calculus…That would change my equation…We’re monitoring that situation very carefully. We have put together a range of contingency plans”. Source: James Ball, the Washington Post, posted here. 18 July 2012: First Iranian letter [or “warning”] sent through Swiss Embassy in Tehran to Washington warning of preparations [by “rebels”] for #CW use in Syria. Scott Peterson reported recently in the Christian Science Monitor that “Iran says that it warned the United States directly, in mid- and late- 2012, and at least once after that, about the risks of chemical weapons among the rebels…The [Iranian] letter acquired by the Monitor references messages from July 18 and Dec. 1, 2012″. Posted here. Peterson’s report followed up on remarks by the new Foreign Minister of Iran, on 1 September 2013, that Iran had informed the US 9 months earlier that “extremist elements” are transferring chemical weapons to Syria. In an interview with the Iranian weekly, Aseman, Iran’s Foreign Minister Mohammad Javad Zarif said the country had sent an official memo to the Swiss embassy in Tehran which represents the US interests section in Iran and informed US that ‘Hand-made chemical weapon Sarin is being transferring to Syria’… “In that memo we warned that extremist groups may use the chemical agents,” Zarif said — although the “Americans never replied to the memo.” This is published here. Source: ‘National executive summary of declassified intelligence: Assessment of Syria’s chemical warfare programme’, French Government report dated 2 September 2013, posted here. Paul Adams @BBCPaulAdams 14 Sep 2013 — US officials in Geneva say Americans and Russians have been discussing how to get rid of Syria’s chemical weapons for a year. US State Dept official[s] briefing on background in Geneva on 14 September: “We had groups that have been meeting for a year between our national security councils to talk about the elimination + destruction of #CW…in Syria, because the entire world understood that if we got to a peace, we were going to have to deal with the chemical weapons… There’ve been, I think, 5 meetings of that group over the past yr, so we already had experience working w/ each other + sharing expert info…But we did not come to this meeting with a full-fledged plan”. This is posted here. “The Syrian army is believed to have tested missile systems for poison gas shells at the end of August, statements from various witnesses indicate. The tests took place near a chemical weapons research center at Safira east of Aleppo, witnesses told SPIEGEL. A total of five or six empty shells devised for delivering chemical agents were fired by tanks and aircraft, at a site called Diraiham in the desert near the village of Khanasir. Iranian officers believed to be members of the Revolutionary Guards were flown in by helicopter for the testing, according to the statements…In recent months, the guards have been replaced and reinforced by more than 100 elite troops from the 4th Tank Division. In addition, power generators and large supplies of diesel have recently been brought to the plant to safeguard the supply of electricity in the event of an attack by rebels, reports say. This is published here. 1 December 2012: Second Iranian letter, or “message”, sent through Swiss Embassy in Tehran to Washington warning of preparations [by “rebels”] for #CW use in Syria. Scott Peterson reported recently in the Christian Science Monitor that “Iran says that it warned the United States directly, in mid- and late- 2012, and at least once after that, about the risks of chemical weapons among the rebels…The [Iranian] letter acquired by the Monitor references messages from July 18 and Dec. 1, 2012″. This is posted here. 3 December 2012: Noah Shachtman and Spencer Ackerman wrote for Wired.com’s Danger Room: “Engineers working for the Assad regime in Syria have begun combining the two chemical precursors needed to weaponize sarin gas [ isopropanol, popularly known as rubbing alcohol, and methylphosphonyl difluoride], an American official with knowledge of the situation tells Danger Room. The U.S. doesn’t know why the Syrian military made the move, which began in the middle of last week and is taking place in central Syria…[Last week] the Syrian military began combining some of the binaries. ‘They didn’t do it on the whole arsenal, just a modest quantity’, the official says … Back in July, the Assad regime publicly warned that it might use its chemical weapons to stop ‘external’ forces from interfering in Syria’s bloody civil war. The announcement sparked a panic in the intelligence services of the U.S. and its allies, which stepped up their efforts to block shipments of precursors for those weapons from entering the country … Fighting around the Syrian capital of Damascus has intensified, as rebel troops captured a half-dozen bases around the city”. 14 December 2012: “With Syrian rebel forces gaining in strength, elite units loyal to Bashar Assad received a frightening order a few weeks ago: begin preparations that could lead to the use of chemical weapons…Danger Room first reported last week that U.S. officials recently saw indications that at least some Syrian military forces mixed precursor chemicals for sarin gas, which got the weaponized stocks to the point where they could be loaded onto planes and dropped. The Washington Post’s Joby Warrick adds detail to that account. Some elite troops received “specific orders” to prep the weapons. At least one Syrian army unit was caught on surveillance photos loading “special military vehicles” that could be used to transport the weapons… Warrick writes that there were fears throughout the U.S. intelligence community that ‘a single commander could unleash the deadly poisons without orders from higher up the chain of command’… Assad’s motivations remain unclear to U.S. officials, but according to Warrick, someone in the Syrian chain of command provided instructions to prep sarin for potential battlefield use about two weeks ago. Assad’s intentions are unknowable, but using sarin will most foreclose on the life-saving option of finding a foreign country willing to accept Assad for exile”. Source: ‘U.S. Surveillance Caught Syria’s Chemical Weapons Prep’, Spencer Ackerman, The Danger Room on Wired.com, 14 December 2012. This is posted here. What Obama said to get Netanyahu to apologize to Turkey for Mavi Marmara "operational errors"
We really don’t know, yet, what U.S. President Barack Obama said, or did, to get Israel’s Prime Minister Benyamin Netanyahu to offer, finally, an apology to Turkey for the deaths of 9 Turkish men [one of them a 19-year-old Turkish-American high school student]… but the fact that one of the dead was a 19-year-old American high school student Furkan Dogan may have been part of Obama’s leverage. Israel has needed to resolve this situation, in which its apology was required by clear and repeated Turkish demands, for a long time. There were hints that a breakthrough might be coming, but nothing solid until last night’s surprise announcement. Obama’s insistence offered Netanyahu a relatively “face-saving” way to do it. An statement issued by the Israeli Prime Minister’s office said that Netanyahu told the Turkish Prime Minister that “the tragic results regarding the Mavi Marmara were unintentional“. UPDATE: The Israeli Government Press Office has just sent around, by email, a new version, which says Netanyahu “made clear that the tragic outcome of the Mavi Marmara incident was not intended by Israel and that Israel regrets the loss of human life and injury“. The Israeli statement also said, with notable pride about its own investigation into the “maritime incident”, that “In light of the Israeli investigation into the incident, which pointed out several operational errors, Prime Minister Netanyahu apologized to the Turkish people for any errors that could have led to loss of life and agreed to complete the agreement on compensation“. Turkish and Israeli diplomats engaged in months of negotiations about the wording of the apology itself and the compensation Israel would offer. Israel insisted on limiting the blame to “operational errors”. There was, reportedly, a three-way phone call between Obama, Netanyahu, and Turkish Prime Minister Recip Tayyip Erdogan, made from a portable trailer set up on the runway at Ben Gurion Airport. Israeli journalists said it was a 30-minute conversation. The New York Times reported here that the call lasted 10 minutes. Obama announced the result either just before or just after Air Force One was in the air, taking off from Israel’s Ben Gurion Airport en route to Amman. “…The Prime Minister expressed regret over the deterioration in bilateral relations and noted his commitment to working out the disagreements in order to advance peace and regional stability. Prime Minister Netanyahu said that he saw Turkish Prime Minister Erdogan’s recent interview in a Danish newspaper and expressed his appreciation for the latter’s remarks. The Prime Minister made it clear that the tragic results regarding the Mavi Marmara were unintentional and that Israel expresses regret over injuries and loss of life. In light of the Israeli investigation into the incident, which pointed out several operational errors, Prime Minister Netanyahu apologized to the Turkish people for any errors that could have led to loss of life and agreed to complete the agreement on compensation”. Turkish officials confirmed that Erdogan had, “on behalf of Turkey”, accepted the apology proferred by Netanyahu. UPDATE: In the new version sent around by the Israeli GPO, the following is omitted: The Israeli statement claimed that “The two men agreed to restore normalization between Israel and Turkey, including the dispatch of ambassadors and the cancellation of legal steps against IDF soldiers”. The Times of Israel reported here that Erdogan said, shortly after the announcement of the apology + its acceptance, that “it was too early to cancel legal steps against Israeli soldiers who took part in the raid on the Mavi Mamara”. As the Times of Israel noted, “four IDF generals stand accused of war crimes over the incident. The indictment, prepared last summer, sought ten aggravated life sentences for each officer ostensibly involved in the 2010 raid — including former chief of the IDF General Staff Gabi Ashkenazi and former head of military intelligence Amos Yadlin”. The Times of Israel also reported, in the same story, that “Erdogan also announced plans to visit Gaza, possibly next month. Hamas’s Gaza prime minister, Ismail Haniyeh, calling Netanyahu’s apology ‘a diplomatic victory for Ankara’, confirmed Erdogan would visit ‘in the near future’, and said this trip would mark ‘a significant step to ending the political and economic blockade’ of the Hamas-controlled Gaza Strip”. According to this report, Erdogan may visit both Gaza and the West Bank in April, “in the context of a general effort to contribute to the resolution process”, Erdogan is quoted as saying. Other Hamas sources were less enthusiastic about the apology, however. The Israeli statement said that “Prime Minister Netanyahu also noted that Israel has already lifted several restrictions on the movement of civilians and goods to all of the Palestinian territories, including Gaza, and added that this will continue as long as the quiet is maintained”. But, this rang a bit hollow a day after four rockets were reportedly fired from Gaza, with two hitting Israeli areas, after which the Israeli Defense Forces announced that they were reinstating crippling restrictions on Gaza’s fishermen that were lifted in a cease-fire agreement with Hamas brokered by Egypt after Operation Pillar of Clouds last November. UPDATE TWO: Laura Rozen wrote on Al-Monitor here that “Once close Israeli-Turkish ties have been deeply strained since Israel’s 2008 Cast Lead operation against Hamas, and more broadly as Erdogan’s ruling Islamist Justice and Peace (AKP) party has moved against the country’s once dominant secular military commanders. Military ties formed the backbone of the Turkish-Israeli alliance at its height, said Dan Arbell, a former Israeli diplomat studying the relationship as a visiting fellow at the Brookings Instition. Even the restoration of formal diplomatic ties now–as well as brisk economic trade–is not likely to return Israel and Turkey to the level of rapport they enjoyed in the past, given the reduced role the Turkish military plays in the country under Erdogan and the AKP, he said. ‘This begins a process of normalization, but I do not see it bringing the countries back to the level of relations they had between them in the 1990s’, Arbell, Israel’s former Deputy Chief of Mission in Washington, told Al-Monitor in an interview Friday, adding that there has been, however, a growing “’convergence of interests’ between Ankara and Jerusalem, including on the Syria conflict and Iran. Though Turkish-Israeli reconciliation was certain to be on the agenda for discussion during Obama’s conversations in Israel this week, Arbell said he was pleasantly surprised at the speed of the diplomatic breakthrough”. The Haaretz report noted that “Over the past few months, Israel and Turkey have been trying to reach an agreement over the wording of an apology, in an attempt to end the bilateral crisis. Just a few weeks ago, Turkey’s Undersecretary of the Foreign Ministry Feridun Sinirlio?lu met in Rome with Israel’s National Security Advisor Yaakov Amidror and envoy Joseph Ciechanover. But during this meeting the parties failed to reach a magic formula to bring the crisis to an end. Part of the reason the reconciliation talks between Turkey and Israel encountered difficulties was because of Erdogan’s inflammatory comments a few weeks ago. During a United Nations Conference in Vienna, Erdogan called Zionism a ‘crime against humanity’, and compared it to fascism. Erdogan’s comments caused great anger in both Jerusalem and Washington”. Perhaps Erdogan said something placatory today, too. Now, back to the opening question: what did Obama do to get Netanyahu to take this step? Here’s one strange theory, from The Washington Institute’s Robert Satloff: “It is no coincidence that Netanyahu spoke by phone with Turkish prime minister Recep Tayyip Erdogan just as President Obama was departing Israel for Jordan, opening the door to a mutual return of ambassadors. Mending ties between the two leaders has long been a U.S. objective. The fact that Obama delivered a highly symbolic (if indirect) rebuke to Erdogan by visiting the tomb of Theodor Herzl — implicitly endorsing the ideology that the Turkish leader recently called a “crime against humanity” — almost certainly gave cover for Netanyahu to reach out to Ankara”... This is posted here. Posted on 22 March 2013 Author Marian HoukCategories Gaza, Israel, Turkey, USATags apology, Israeli Prime Minister Benyamin Netanyahu, Mavi Marmara, President Barack Obama, Turkey, U.SLeave a comment on What Obama said to get Netanyahu to apologize to Turkey for Mavi Marmara "operational errors"
US shifts approach: forget Israeli settlement freeze, focus instead on "core issues"
The U.S. is rolling out a new approach to the Israeli-Palestinian impasse: it has decided to abandon its attempts to get Israel to extend a “moratorium” on settlement building on occupied Palestinian territory, and instead will try to get the parties to focus on “core issues“. Israeli settlements have, of course, always been one of the “core issues” of this conflict. The U.S. will apparently propose now, however, that discussions on settlements should be held without reference to anything that might appear to be either a solution or a precondition — such as a “freeze” or “moratorium” on settlements. Continue reading US shifts approach: forget Israeli settlement freeze, focus instead on "core issues"
Posted on 10 December 2010 Author Marian HoukCategories Israel, Middle East Peace Process, Negotiators and negotiations, Palestine & Palestinians, USATags core issues, Israel, Palestinians, U.SLeave a comment on US shifts approach: forget Israeli settlement freeze, focus instead on "core issues"
This is interesting in and of itself – but all the more so because, as Meir Javendar points out here, “Early next week, Iran and the P5+1 (the five permanent members of the UN Security Council plus Germany) are scheduled to meet to discuss Iran’s nuclear programme”. The UN Security Council has imposed three sets of sanctions against the Islamic Republic of Iran [basically, for not inspiring confidence in its nuclear program] and the U.S. and others have imposed an additional set of unilateral economic sanctions. [Kim Ghattas of the BBC] QUESTION: A follow-up question about Iran. On Monday in Geneva, Washington and its partners in the P-5+1 will hold talks with Iran about its nuclear program. You’ve tried this before. You thought it would work last time. Why do you think it will be different now? SECRETARY CLINTON:” Because I think that Iran has realized since the last meeting, which was in October 2009, that they’re not going to escape pressure from the international community. They were quite surprised to have the entire world decide to impose sanctions. They didn’t think that would happen to them. They’ve been surprised that the United States, European Union, Japan, and others have imposed additional sanctions, and that the vast majority of the nations in the world are honoring those sanctions. We know that they’re having an effect inside Iran. So I think Iran comes to the table with a much more sober assessment of what isolation means, what the impact on their economy has been, and we hope that will cause them to have the kind of serious negotiation we’re seeking”. QUESTION: But a quick follow-up, if I may. Why not cut to the chase and tell Iran that it can enrich its own uranium on its own territory, since everybody knows that this what is probably the end result. SECRETARY CLINTON: “Well, we told them that they are entitled to the peaceful use of civil nuclear energy. But they haven’t yet restored the confidence of the international community, to the extent where the international community would feel comfortable allowing them to enrich, which is why with the Bushehr plant that Russia has helped build, Russia is not letting them enrich. Russia is taking the spent fuel out and reprocessing. Iran has to come to the table recognizing that they have lost the confidence of even longtime supporters and allies or those who believed them, took them at face value. They can do this, and then they can enrich uranium at some future date once they have demonstrated that they can do so in a responsible manner in accordance with international obligations”. Palestinian Authority Prime Minister Salam Fayyad attended the Friday prayers at the Ibrahimi Mosque in Hebron today. In remarks to journalists in Hebron, Fayyad accused Israeli Prime Minister Benyamin Netanyahu and his government of “expropriating” or “annexing” the Ibrahimi (Abraham) Mosque and several other sites important to the three monotheistic religions, including Rachel’s tomb in Bethlehem. Agence France Presse reported that Fayyad said: “The Palestinian people understand extremely well that this decision has a political dimension, and that it is aimed at Israel expropriating sites that are part of an occupied territory … These sites belong to a future Palestinian state”. According to AFP, Fayyad also reaffirmed “the inalienable right of the Palestinian people on their soil”. AFP also reported that “the head of the United Nations cultural body UNESCO ‘expressed her concern” at the plan and the ‘resulting escalation of tension in the area’. UNESCO chief Irina Bokova endorsed a statement by Robert Serry, UN coordinator for the Middle East peace process, that the sites have ‘historical and religious significance not only to Judaism but also to Islam and to Christianity’.” She also “reiterated UNESCO’s long-standing conviction that cultural heritage should serve as a means for dialogue”. This AFP report is posted here. The Jerusalem Post reported that “Palestinian Authority Prime Minister Salam Fayyad visited Hebron on Friday and prayed at the Cave of the Patriarchs on Friday afternoon, criticizing Israel’s decision to add the site and Rachel’s Tomb in Bethlehem to the list of Jewish heritage sites marked for renovation and preservation. Speaking to reporters after prayers, Fayyad accused Israel of ‘annexing’ the Cave of the Patriarchs. ‘[Prime Minister Binyamin] Netanyahu’s decision is dangerous and political in nature. The site is an inseparable part of the occupied Palestinian territories’, [Israeli] Channel 10 quoted Fayyad as saying”. The JPost added that “US State Department spokesman Mark Toner said the administration viewed the move as provocative and unhelpful to the goal of getting the two sides back to the table. Toner said US displeasure with the designations of the Cave of the Patriarchs in the flash point town of Hebron and the traditional tomb of the biblical matriarch Rachel in Bethlehem had been conveyed to senior Israeli officials by American diplomats”. This JPost report is published here. The declaration, last Sunday, by Israeli Prime Minister Netanyahu, and endorsed by his Cabinet, did not announce any legal annexation of the sites. But, this is what the Palestinians fear is the logic. Palestinians also fear, not without justification through experience, that the allocation of large sums of Israeli money for the maintenance and preservation of these sites as part of Israel’s heritage is likely to entail preferential Israeli access and denial of Palestinian access. Clashes continued for a fifth day between stone-throwing Palestinian youths and Israeli troops in Hebron about the Israeli government decision to declare the Ibrahimi Mosque an Israeli heritage site. Ma’an News Agency reported that Jewish settlers, accompanied by Israeli soldiers, marched through downtown Hebron on Friday in support of the Israeli government decision. Separately, a group of about 300 Israeli, Palestinian and international activists marched in the rain to call for an opening of part of central Hebron which has been locked down under Israeli military pressure for several years in favor of a Jewish settler presence in the neighborhood. Spanish FM to Sahrawi hunger striker who may be on verge of death: "Abandon hunger strike"
(1) According to a report from AFP on 21 November, “Western Sahara activist Aminatou Haidar has declined an offer by Madrid to grant her refugee status following her expulsion from the territory by Morocco, a representative said Saturday … Haidar is at the airport on the island of Lanzarote [n.b. the Spanish-ruled Canary Islands] demanding to be sent back to the Western Sahara capital of Laayoune to recover her passport confiscated by Moroccan authorities last week. ‘The government is ready, if Ms Haidar asks, to grant her refugee status as soon as possible and provide her with all the necessary documents (so she can travel)’, the Spanish foreign ministry said in a statement Friday. The ministry said it would act if the Moroccan consulate in Spain turns down her request for a new passport. But Haidar refuses to apply to the consulate, saying she wants her old passport back. Morocco’s ambassador to Spain, Omar Azziman, said she could receive her passport back if she recognized her Moroccan nationality. ‘Perhaps if Aminatou Haidar recognized her Moroccan nationality, her passport would be returned. At the moment it is impossible’, he told reporters. ‘It is not Spain or Morocco that has a problem, it is she, and the solution therefore is in her hand’s. Moroccan authorities arrested Haidar on November 13 on her arrival in Laayoune from Spain’s Canary Islands. Immigration officials immediately sent her back to the archipelago after confiscating her passport. She used her Spanish residency permit to re-enter the country. Spanish Foreign Minister Miguel Angel Moratinos said that in the face of Haidar’s refusal there was nothing more he could do, adding that he had already expressed his concern about her case Thursday in a meeting with his Moroccan counterpart Taieb Fassi Fihri…” This report can be read in full here. (2) Then, on 6 December, AFP reported that “The health of Western Sahara activist Aminatou Haidar is deteriorating as she ends her third week on hunger strike to demand Morocco allow her to return home, one of her aides said Sunday. ‘She is going through a dangerous period’, Fernando Peraita, the spokesman for Haidar’s support group said at the airport in Lanzarote, in Spain’s Canary Islands, where the award-winning human rights activist is staging her hunger strike. ‘The danger comes from the fact her mental state make her seems better than she really is. She is suffering from dizziness and loss of vision. She spent a bad night, in pain’. A doctor attending to her, Domingo de Guzman Perez Hernandez, told the El Pais newspaper her life is now threatened. ‘Her time is coming to an end. We’re not talking in terms of weeks but in hours or days’, he said. The 42-year-old went on hunger strike on November 16, three days after Moroccan authorities denied her entry into her native Western Sahara, a disputed territory annexed by Morocco in 1975, allegedly confiscated her passport, and sent her back to Lanzarote. The mother-of-two, who campaigns for the independence of the Western Sahara from Morocco, has camped at the Lanzarote airport to draw attention to her cause … On Saturday, Moroccan authorities again refused to allow her to return to Laayoune. 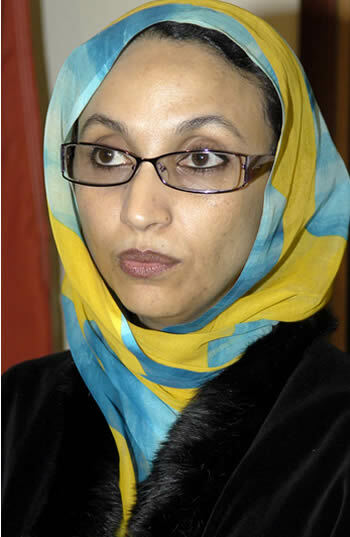 Peraita said Haidar is also appealing to the international community for protection for her family in Western Sahara. He said Spanish journalists seeking to interview her two sons, aged 13 and 16, were prevented from entering the house by Moroccan police. Haidar, visibly weak, remained Sunday in a small room of the airport, only emerging in a wheelchair to go the toilets accompanied by a member of her entourage … Spain had offered to give Haidar refugee status or Spanish citizenship so she could be allowed to return home but she rejected both options on the grounds that she did not want to become ‘a foreigner in her own home’. Moroccan Foreign Minister Taieb Fassi Fihri said last week that Haidar had ‘disowned her identity and her nationality’ and ‘must accept, on her own, the legal and moral consequences which result from this behaviour’ … Haidar won the Robert Kennedy human rights prize in 2008 as well as several other awards for her activism on behalf of Western Sahara” … This AFP report can be read in full here. QUESTION FROM A JOURNALIST (via the INTERPRETER): Sure. Mr. Minister, if we understood correctly, you discussed the issue of Sahara. Right now, there is a problem with a Western Sahara citizen that you were aware of. What type of cooperation did you ask from the United States over that issue? Also, last week, it was said that there is no intervention necessary right now from the king. At what point would the king’s intervention be necessary? Posted on 15 December 2009 Author Marian HoukCategories Boundaries & Borders, Western SaharaTags Aminatou Haidar, Morocco, Polisario, Secretary of State Hilary Clinton, Spanish Foreign Minister Miguel Moratinos, Spanish-ruled Canary Islands, U.S, Western Sahara2 Comments on Spanish FM to Sahrawi hunger striker who may be on verge of death: "Abandon hunger strike"
According to their latest update, maybe only one ship will go, but they will not be taking cement. They say they have a plan. The activists said last night that “our ships were not given permission to leave today [Thursday] due to concerns about our welfare and safety. Our friends in Cyprus tell us that the voyage to Gaza is too dangerous, and they are worried we will be harmed at sea”. In response, the group says, they intend to deliver a waiver “signed by all going to Gaza, that we absolve Cyprus of all responsibility for our safety” — and will set sail anyway today, Friday. If it actually departs, this would be the eighth Free Gaza expedition from Cyprus to Gaza — and it might be the last. The two boats in this expedition were supposed to be carrying “3 tons of medical supplies, and 15 tons of badly needed concrete and reconstruction supplies”, according to the Free Gaza movement, which began sea expeditions to Gaza last August with the express intention of breaking the seige — which Israel has since elevated into a formal naval blockade of Gaza. In its latest statement issued Thursday night, the Free Gaza expedition spokespersons said that “The purpose of nonviolent direct action and civil resistance is to take risks – to put ourselves ‘in the way’ of injustice. We take these risks well aware of what the possible consequences may be. We do so because the consequences of doing nothing are so much worse. Anytime we allow ourselves to be bullied, every time we pass by an evil and ignore it – we lower our standards and allow our world to be made that much harsher and unjust for us all”. They added that “The journey to Gaza is dangerous. The Israeli navy rammed our flagship, the Dignity, when we attempted to deliver medical supplies to Gaza during their vicious assault in December/January. Israel has previously threatened to open fire on our unarmed ships, rather than allow us to deliver humanitarian and reconstruction supplies to the people of Gaza. The risks we take on these trips are tiny compared to the risks imposed every day upon the people of Gaza”. On Friday afternoon, the group indicated it was buying childrens’ toys to take with them to Gaza (in place of the cement, which Israel bans). But actually, childrens’ toys are banned as well — as the Israeli military-administered sanctions are said to be designed to allow in only the most basic supplies needed, a *humanitarian minimum”. Nobel peace laureate Mairead Maguire is also on the passenger list, which is posted here . There do not appear to be any journalists on board — and there has been precious little media interest in this saga. The groups’ statement added that “Cyprus has been a wonderful home for the Free Gaza Movement over these last 10 months. Cypriots know first-hand the terrible consequences of occupation. They too know what it is to suffer from violence, injustice, and exile. Since our first voyage to break through the siege of Gaza, the Cypriot authorities have been extremely helpful and understanding of our goals and intentions”. Nevertheless, the Free Gaza movement is indicating it plays to defy the Cypriot authorities on this matter. A Cypriot diplomat in the region says that there is no physical way the Cypriot authorities will try to stop this Free Gaza expedition from leaving port, if they intend to do so. But it would be a violation of Cypriot law or regulations, he indicated, because there is no “port” at the Free Gaza expedition’s destination in Gaza. While this technicality (the lack of a “port” in Gaza) was not invoked by Cypriot authorities during the earlier Free Gaza expeditions, there has been a powerful international effort in recent months to close all the loopholes. And, the Cypriot diplomat added, “we cannot stop them, if they tell us they’re going to Crete, or someplace else, then change once they’re at sea and head toward Gaza”. But, he added, if they do so, they will lose their base of support in Cyprus. Israel allowed the first expeditions to pass, explaining that they did not want to give the Free Gaza activists a propaganda victory. But, toward the end of the year, Israel took an increasingly tough stance. During the IDF’s Operation Cast Lead (27 December – 18 January), Israel announced its formal naval blockade on 3-4 January, the day that the Israeli Army began its ground invasion. And, a day or two before the Israeli government finally agreed to international calls for a cease-fire, the U.S. Secretary of State at the time, Condoleezza Rice, signed a formal agreement with Israel’s then-Foreign Minister Tzipi Livni — the consequences of which were not all fully and immediately public — to participate in naval activities as part of a global interdiction of arms shipments that might be used by Israel’s enemies, either in Gaza or by one of Israel’s main nemesis, Hizballah, in Lebanon. Israeli human rights activist Jeff Halper, head of the Israeli Committee Against House Demolitions (ICAHD), who sailed with the first Free Gaza expedition from Cyprus to Gaza last August — and when he left Gaza by land via Israel’s Erez “border” terminal to return to his home in Jerusalem, he was arrested and jailed for his trouble. He was freed on a modest bail, and charges against him are still pending. He told me recently that he was thinking of participating in this Free Gaza expedition — but that he had heard that “UN forces” were a second level of interdiction operating in the Mediterranean Sea, and might also try to intercept the next expedition. I asked the UN spokespersons in Jerusalem and at UNHQ/NY if they knew anything about this, but they all expressed astonishment. UNIFIL is the first UN peacekeeping operation ever to have a maritime component. It was deployed after Israel’s most recent war against Lebanon in the summer of 2006. According to a UNIFIL press release, “an Interim Maritime Task Force was deployed until 15 October 2006, when the UNIFIL Maritime Task Force led by Germany took over. On 29 February 2008, Germany handed over command of UNIFIL Maritime Task Force to the European Maritime Force (EUROMARFOR) led by Italy. Under this arrangement it was for the first time that EUROMARFOR – a Maritime Multinational Force formed in 1995 by France, Italy, Portugal and Spain to carry out naval, air and amphibious operations – operated under a United Nations mandate. The EUROMARFOR held command of UNIFIL MTF for one year, first under Italy’s lead (29 February – 31 August 2008) and then under France (1 September 2008 – 28 February 2009). On 1 March 2009, France/EUROMARFOR handed over the command of MTF to Belgium“… This press release is posted on the UNIFIL UN website here. The European Union’s Maritime force, EUROMARFOR, which has participated in various naval interdiction missions, actually took over command of the maritime component of the UN’s peacekeeping mission in Lebanon, UNIFIL, and operated under a United Nations mandate for one year — from 29 February 2008 until 28 February 2009. I then corresponded with a spokesperson of the UN’s Department of Peacekeeping Operations (DPKO) at UNHQ/NY, to ask if there were anything to this story. But the answer I received was this: “On the interdiction question, I daresay there would not be anything of the sort outside of Lebanon’s coastal waters, in line with Security Council resolution 1701 which defines the mandate of UNIFIL and its MTF. I’ve also cc’ed colleagues at UNIFIL who may have suggestions/thoughts/insight on this”. However, there was no further information forthcoming, either from DPKO in New York, or from the colleagues at UNIFIL.